Our pre-packaged robotic systems can help maximize output capacity for your manufacturing facility. Productivity offers a number of pre-engineered RoboFlex® automation packages to provide flexible solutions to your current manufacturing challenges. RoboFlex® systems are automated machine tending systems. 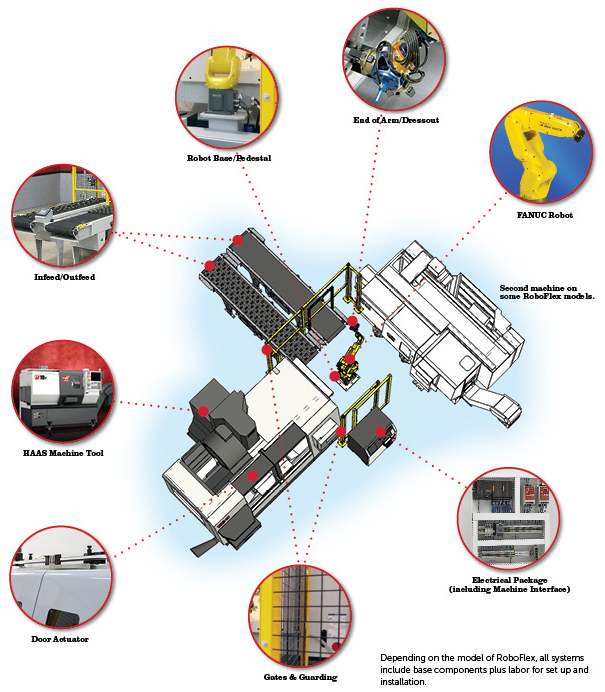 This diagram illustrates the core sub-systems in a typical machine tending cell which allows a robot to load/unload your machine tools. In each of our systems, our engineers have combined these sub-systems to ensure that the robot can successfully perform the repetitive task of part exchanges during machine operation. This allows you to get the most productivity from your equipment and employees. 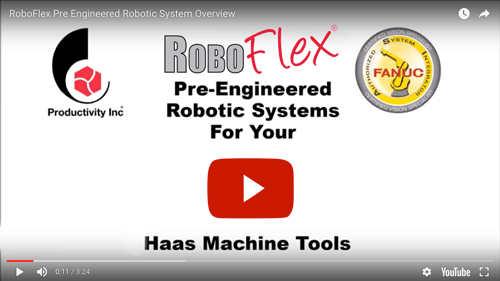 Watch and see how RoboFlex can add productivity to your Haas machines. The RoboFlex Value Package is a palletized drawer system. RoboFlex Docking System is a palletized cart system. RoboFlex Conveyor System is an infeed/outfeed conveyor system. RoboFlex Material Closet is a vertical tray feeding system. RoboFlex Pallet Station is a floor-mounted pallet system. RoboFlex Flex Feeder is an intelligent bulk flex feeder system. Learn how to lower your initial investment, shorten lead times and get predictable results.